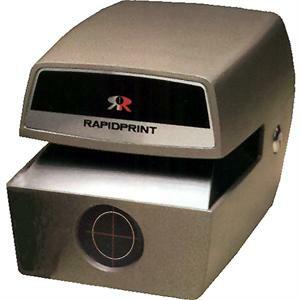 The Rapidprint C724-E Dual Head Mechanical Time, Date and Numbering Machine Stamp allows for double print heads, providing the most reliable Mechanical Date-Time and Numbering Machine Stamp all-in-one. The Rapidprint C724-E prints a 6-digit number automatically advancing the number on the same line as the date and time. These heavy-duty stamps provide maximum versatility of operation and of print options, allowing for quick recording on all your business forms from onion skin to1/4" thick. The Rapidprint C724-E allows for the addition of upper and/or lower die plates for static text to be included with each stamp (2 sets as there are two print heads in this model). Die plates can be purchased separately and can be included with the time-date stamp pre-installed (allow extra time for delivery, whether pre-installed or not, die plates can take up to three weeks for delivery) Text (or die) plates can have up to 3 lines of text above or below the time-date imprint (19 characters per line including spaces). Dimensions: 7.37" x 7.25" x 10.13"